As long as there have been civilizations, people have been bridging, damming, channeling—using—rivers to make their lives easier. Of all the ways that rivers can be changed, dams alter the personality and flow of a river more than any other manmade structure. Whole towns have been moved or buried under water when large dams have been constructed. These gigantic lakes, reservoirs, are used for recreation and power generation. With dams, people control flow of the river. Few large rivers, those that consistently flow year round, have not been dammed. In South Dakota, alone, four dams block the Missouri River. A debate continues in the Pacific Northwest about whether to destroy old dams or not. Because they impede salmon migration, dams have been the scourge of fisherman, environmentalists, and Native American tribes. Water and rivers usually mean life. Like people, animals are drawn to rivers. Many of the world’s wide variety of plants can be found along the banks of great rivers—most notably tropical rivers like the Amazon. As early explorers, like Lewis and Clark, traveled up and down big rivers into unknown reaches, they discovered dozens of new species along the banks. Though they can have an awesome destructive force when they flood, rivers regularly and normally flood as part of a natural cycle. As much as man tries to harness rivers, they still meander, changing their courses as if they have minds of their own. The longest waterway in the United States, and fourth longest in the world, is the Missouri-Mississippi system, running from the headwaters of the Missouri in Montana to Louisiana and the Gulf of Mexico—more than 3,800 miles. 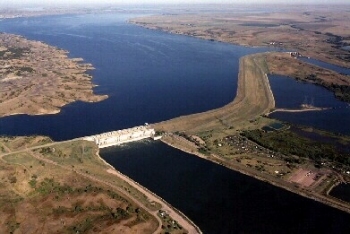 Technically, the Missouri River flows from the Rocky Mountains in the west to its confluence with the Mississippi River at St. Louis, Missouri, passing through Montana, North Dakota, South Dakota, forming the border between Iowa and Nebraska and part of the border between Kansas and Missouri before bending east through the heart of the Show Me State.